I call this my "faux trifle" because I substitute whipped cream for custard, a standard ingredient in trifle. 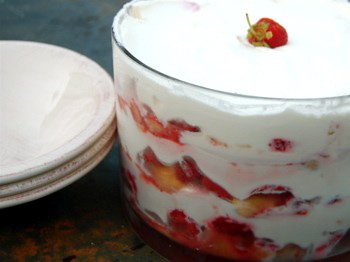 Rather, it's a trifle in technique and appearance: the layering of light, summery dessert ingredients in a glass bowl. For an easy-to-make dessert for a crowd, you can't beat it: sweet berries, sponge-cakey cookies, and whipped cream. Gently wash and dry the berries. Slice them into a large bowl and sprinkle with the sugar. Let the berries sit until the sugar has drawn the juices out of the berries, about 20 minutes. Scoop a cup of the berries into a blender, adding all the accumulated juice and the orange liqueur; purée. Put the whipping cream and a sprinkling of sugar in a large bowl. Whip the cream into soft peaks. To assemble the trifle, layer the bottom of a large glass bowl with some of the cookies. Pour half of the berry purée over the cookies, top with half of the cut-up berries, then spoon a layer of the whipped cream over everything. Add another layer of cookies, the rest of the purée, then all of the berries and a final layer of whipped cream. Put this in the refrigerator and leave alone for 2 to 3 hours. To serve, take a large spoon and scoop down to the bottom of the bowl, so that each serving has all the layers of the trifle on the plate. Instead of ladyfingers, you can substitute dice-sized cubes of poundcake.